Joycelyn Bradshaw Chugg passed away May 23, 2017. 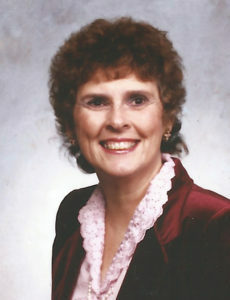 Joycelyn was born to Hampson Walters and Afton Perry Bradshaw on April 13, 1933, in Tremonton, Utah. She grew up in Tremonton and graduated from Bear River High School. While in high school, Joycelyn displayed several talents. She was a twirler in the marching band, sang in the acapella choir and loved to harmonize with her father around the house. During her senior year, she was asked to direct the first of many road shows. Music was important in her life. She loved to sing and had a beautiful voice. Joycelyn also enjoyed attending Brigham Young University. She married Lee Russon Chugg in the Logan LDS Temple on May 22, 1953. Lee was drafted into the Army in the fall of 1952. They lived in Fort Ord, California, which was the start of many adventures while living in six states during their wonderful marriage. She is survived by her husband, Lee; brother, Dean Bradshaw of Mesquite Nevada; and children: Gregory (Leslie) of Gilbert Arizona, Debra (Michael Astin) of South Jordan, Utah, Rodney (Danett) of Riverton, Utah, Kevin (Jan) of Tucson, Arizona, Curtis (Miryam) of Boulder City, Nevada. Lee and Joycelyn have 23 grandchildren, and 31 great-grandchildren with 1 on the way. Funeral services will be held at 11 a.m. on Tuesday, May 30, at the Winchester Hills LDS Chapel located at 5338 N. Winchester Drive South, St. George, Utah 84770. The family will receive friends Tuesday from 9:30-10:45 a.m. prior to services. Interment will be at the Tonaquint Cemetery. Arrangements have been entrusted to the care of Metcalf Mortuary, 435-673-4221. For condolences, full obituary, and funeral listings please visit Metcalf Mortuary online.